Treat your coffee drinking friends to this DIY perfect coffee lovers gift basket, crammed full of their favorite coffee themed treats. Deck the halls with lots of baskets…gift baskets that is! I just love to come up with all kinds of gift baskets to treat my family and friends to their favorite special loves this time of the year. Since both my husband and daughter are coffee fanatics, I decided to put together a coffee lovers gift basket to give to both of them to share. 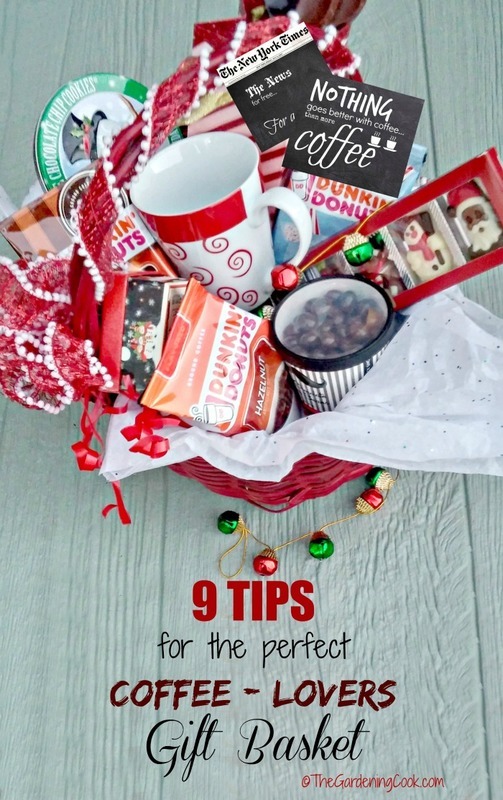 Making the perfect DIY coffee lovers gift basket is easy if you follow just a few tips and tips. Choose a pretty basket. 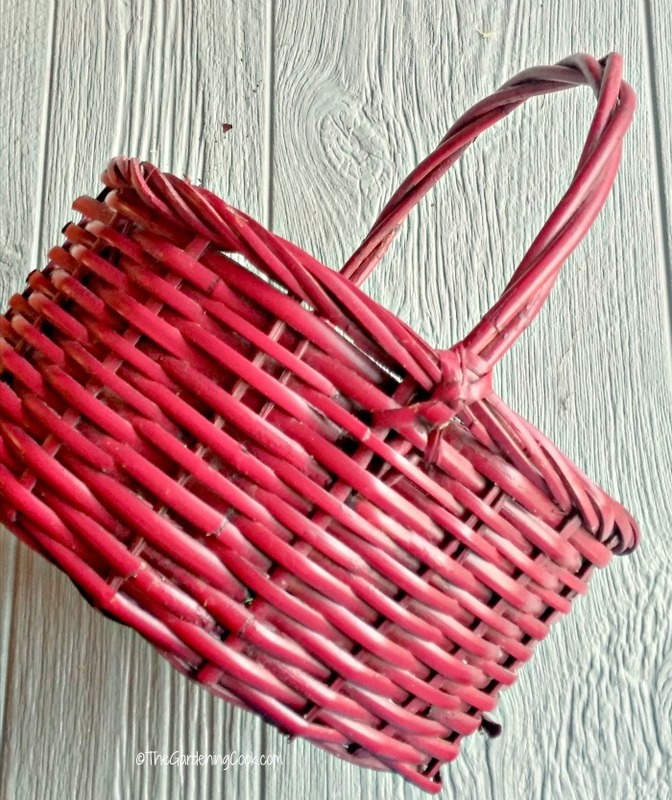 I love to use a basket that looks festive now, like my burgundy painted basket with a handle, but one that can be used later for something more functional. Or you could choose one that matches the decor of their house. 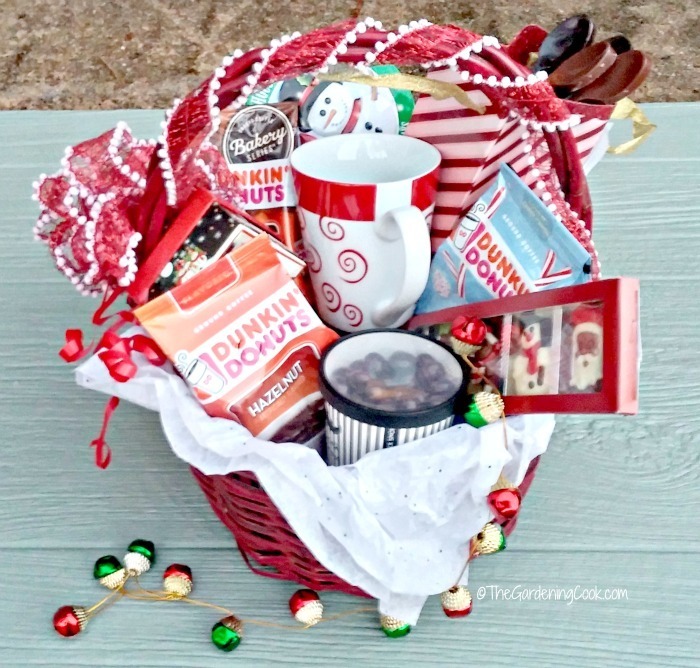 This basket looks great all dolled up with my coffee goodie presents, and can be used in any number of ways later in the year when the holidays have come and gone. Be smart with the size: Once you have the coffee flavors chosen, add some crumpled newspaper to the bottom of the basket and line it with some pretty holiday tissue paper. This helps to display the products well and adds some height so you don’t have to fill it as much. Three blends take up most of the room in my basket, yet it is quite large. Add something sweet. 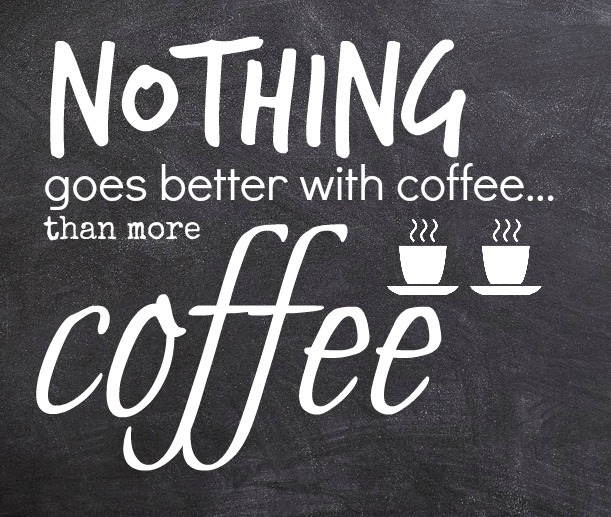 Because I ASK YOU…what goes better with coffee than chocolate? Just sayin’…nothing much in my book. And besides, I can enjoy a bit of the basket too. 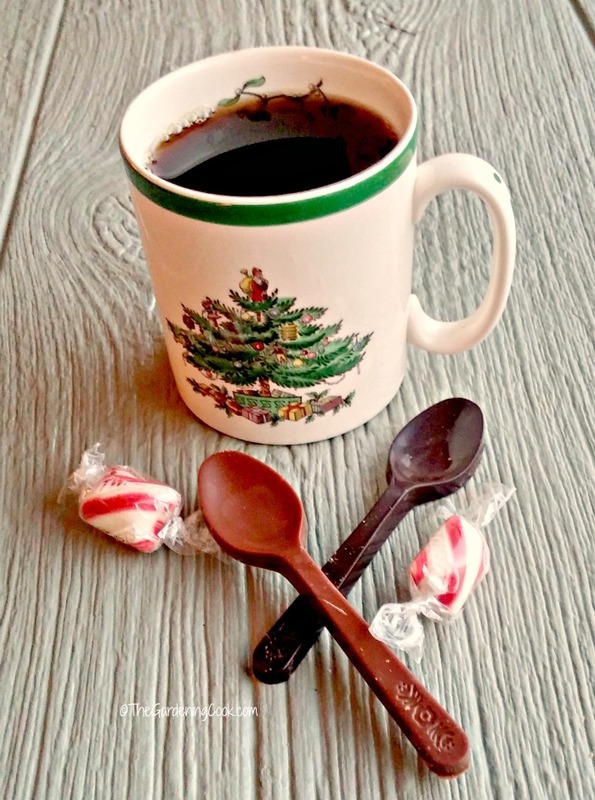 I don’t drink coffee, but I sure do love chocolate…and peppermints…and candy…and…OOPS…got carried away there! There are tons of ideas for candy this time of the year. 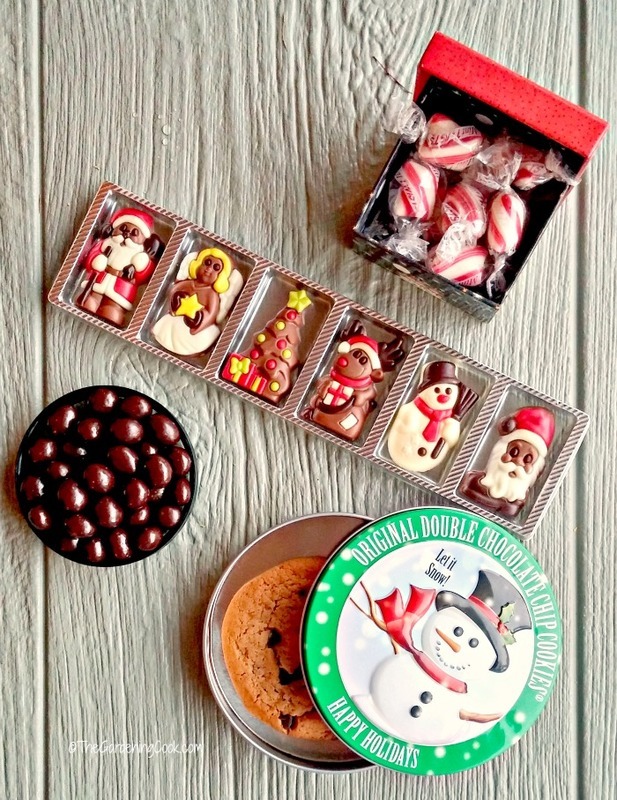 I chose peppermints, some holiday chocolate pieces, espresso chocolate covered beans and a fresh baked chocolate chip cookie in a decorative holiday tin. Add something to drink the coffee in. Sure, everyone has coffee cups, but they can also use a festive decorative cup as well. I used a large festive holiday cup for this basket since they both love a big cup. Add a subscription for something to read. This is a gift that will keep on giving. Do they like to do crossword puzzles? Put in a book of them. Are they avid newspaper readers? 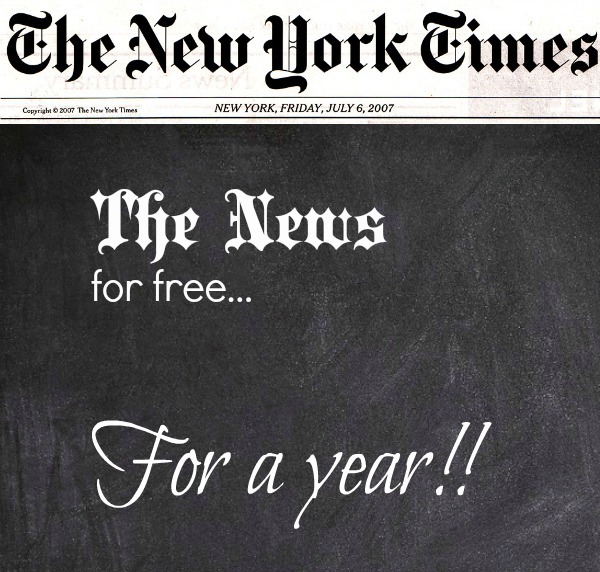 How about a subscription to the New York Times for a year? Your recipients will think of you every time they take a sip and read the paper. Trust me on this one. I just printed this free printable graphic out on photo paper and taped the subscription notice to the back of it. Don’t forget the decorative touch. Dress up your basket with pretty ribbon and a festive bow for the perfect holiday touch. Sure, it’s not coffee related, but it does make the basket look great, and this is a gift, of course, so you want the best presentation. I chose a cute bow made from wired edged ribbon that I use on my daughter’s presents each year and she loves it. If you don’t know how to make a holiday floral bow like this, see a tutorial here. Add a fun printable. I made this graphic and printed it out on photo paper and added it as a fun coffee moment in the basket. 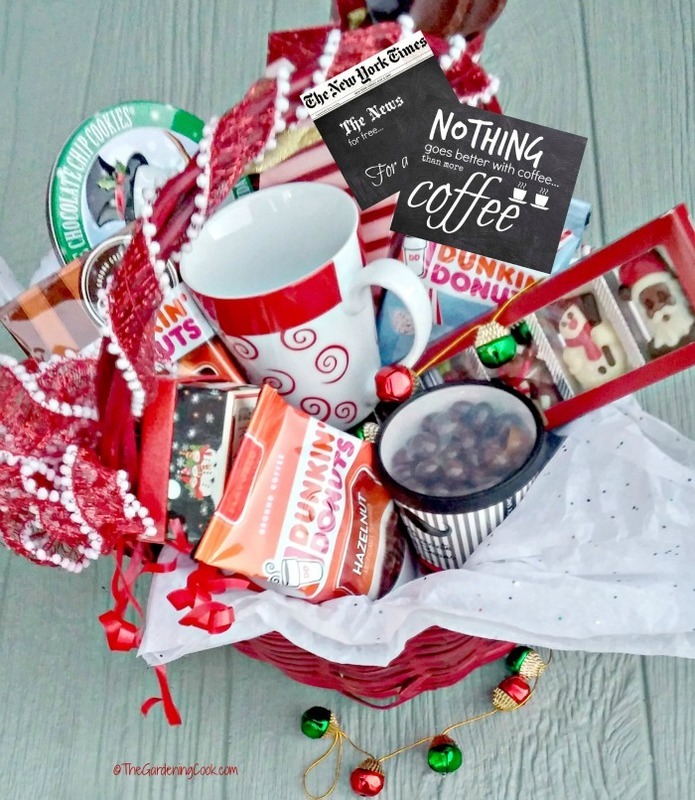 It added just the right mood to the look of the gift and is a message that all coffee lovers will agree with ~ nothing goes better with coffee…than more coffee. You can say what you want about chocoate and other goodies, but real coffee fanatics are perfectly happy with a second cup! You can print out this free printable here. What could be easier to do than this? The whole project took me less than 30 minutes to put together, is full of both Richard and Jess’ favorite things to eat and drink. Here is the finished basket. I can’t wait till they open it and start to share the goodies. 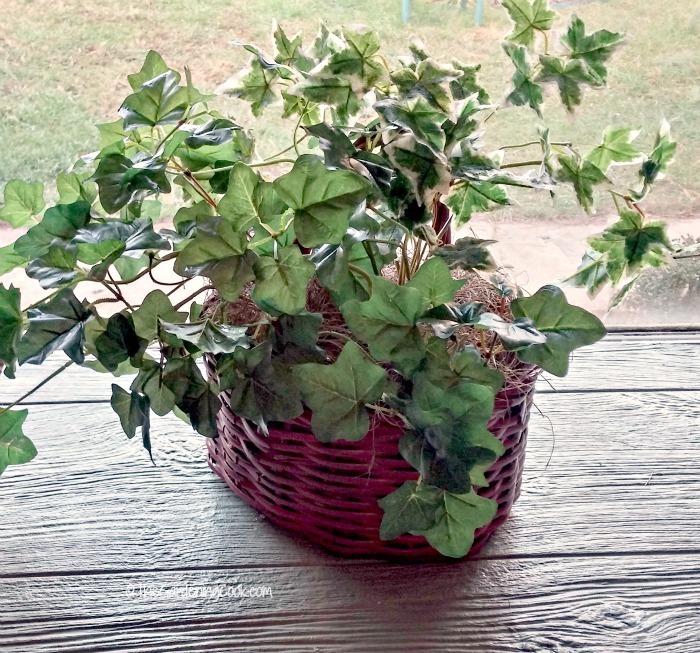 And here is the basket used at another time to hold some silk leaves to dress up a windowsill. What a functional gift it will be! It’s hard to believe it’s the same basket, isn’t it? 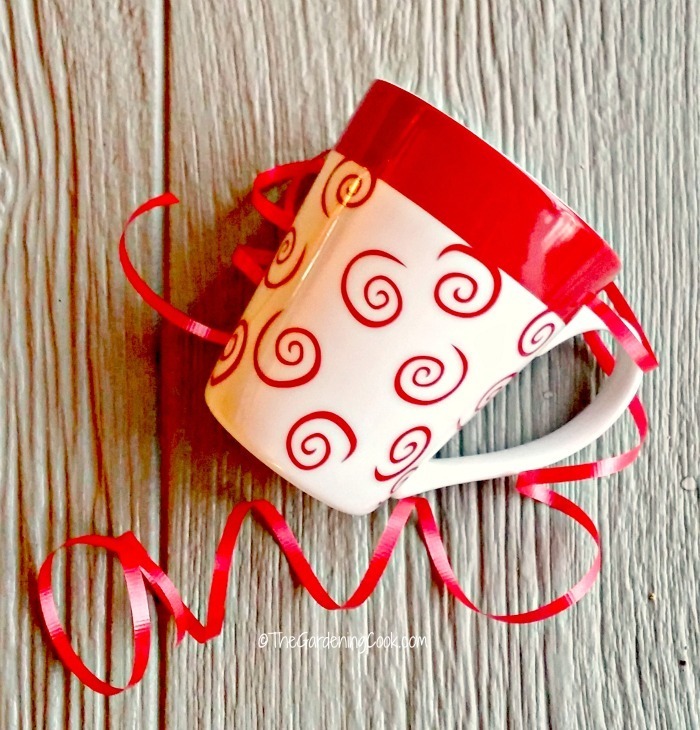 Would you like to make your own coffee lovers gift basket for a special person? 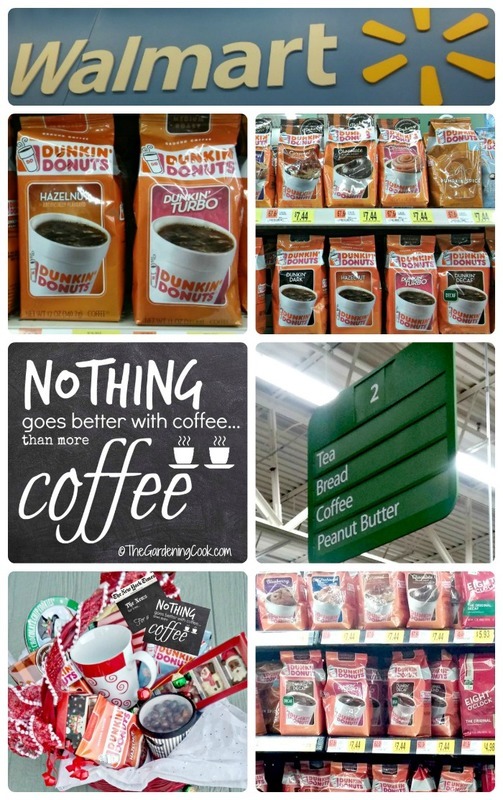 Head on over to Walmart and see their Dunkin’ Donuts® coffee selection. You will find everything you need in the coffee aisle and they have a seasonal aisle for other fun things to add. Dunkin’ Donuts® have a huge range of flavors to choose from and many seasonal varieties that are perfect for the holiday. They are sure to have a flavor that will delight any coffee fan. You can even save $1.00 on the price of the coffee with this special offer from Ibotta. 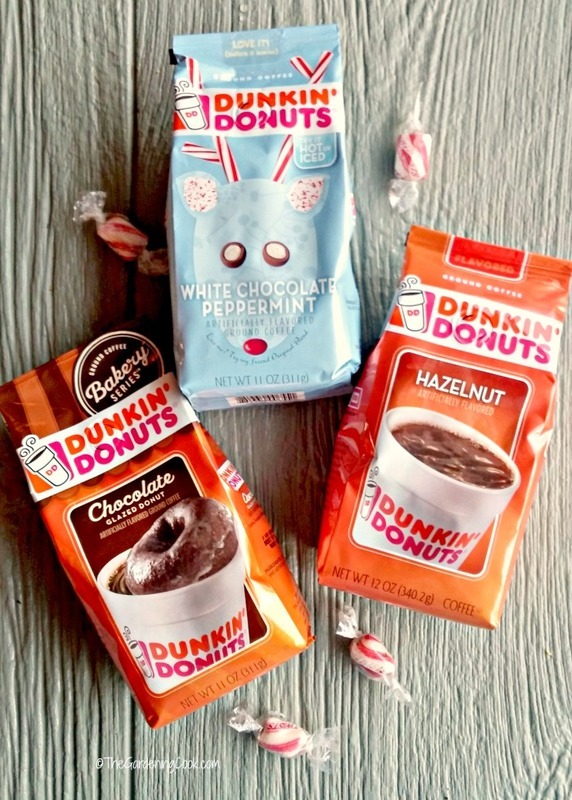 Now you can enjoy Dunkin’ at home! 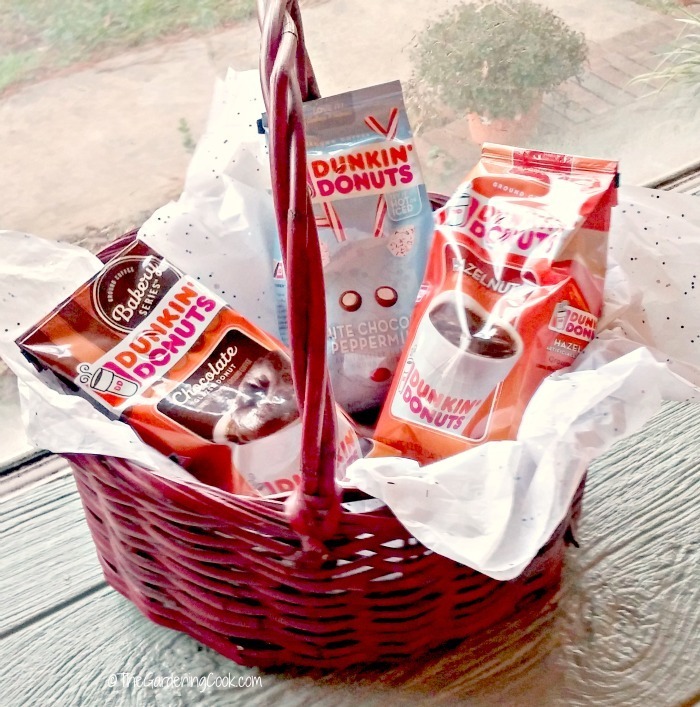 What would you put in your coffee lovers gift basket? I’d love to hear your ideas in the comment section below.